Early on a Friday morning near the end of the school year, Dan Ryder stands in front of his 9th grade English class with a set of directions. These student solutions — these protoypes — don’t look like posters or models. Instead, Ryder wants these students to take a character — this one from Romeo & Juliet — and figure out what problem they’re facing. Then, he wants them to design a real solution that could fix it. And these aren’t just ideas — these are real, working, protoypes. 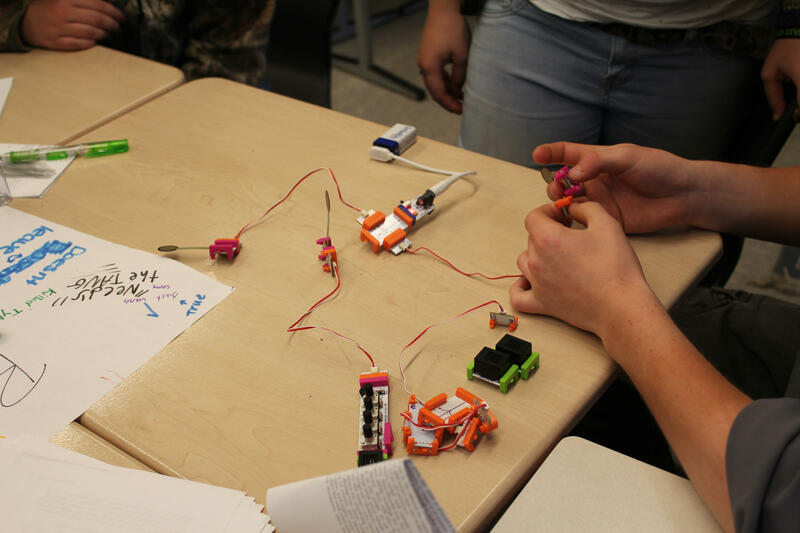 Quickly, the freshmen dive after Legos and little electronic components called “Little Bits.” Soon, their prototypes are whirring with lights and sounds. As you watch all this unfold, you’ve often got to remind yourself that you’re still in an English classroom. Ryder says he can tap into those transferable skills through an approach known as “design thinking.” It’s been used in business for years, but rarely in education. Ryder’s thread of design thinking looks like this: It starts out normally. Students read a book and talk about the ideas inside it. But then things get unusual. Students pick a character and try to empathize with that character to think about the major problems that character must be facing. Then, like an inventor might, students write down all the ways that they might fix that problem. Then they pick one of their solutions, and with the help of 3D printers, Legos and Little Bits, students actually create their solutions. Ryder developed all these methods about three years ago, when he was growing frustrated with his teaching. Specifically, he kept asking kids to make posters and projects that looked nice but didn’t really show deep learning. But then Ryder stumbled across design thinking online. And he saw that by using methods traditionally associated with engineering, students are forced to go deep into the literature — to think about characters, motives, deeper issues, and how they connect to real life. After only 45 minutes, the results speak for themselves. One group has created a system of sensors meant to detect when too much fighting is going on between the Montagues and Capulets. Meanwhile, Sophomore Zach Davis has made a device to monitor Romeo’s heartbeat and calm him down to help him make more rational decisions. But Davis says transitioning to this new kind of learning wasn’t easy. He says it took time for him to realize that he wasn’t just playing around with Legos, but thinking about literature in a new way. Matt Drewette-Card is the curriculum-instruction-assessment coordinator for the Dexter school district. Drewette-Card says in the big picture of education, design thinking is still a niche, mostly used in classes like science and engineering. But he says Ryder’s approach of blending all that together into a traditional English curriculum is novel. 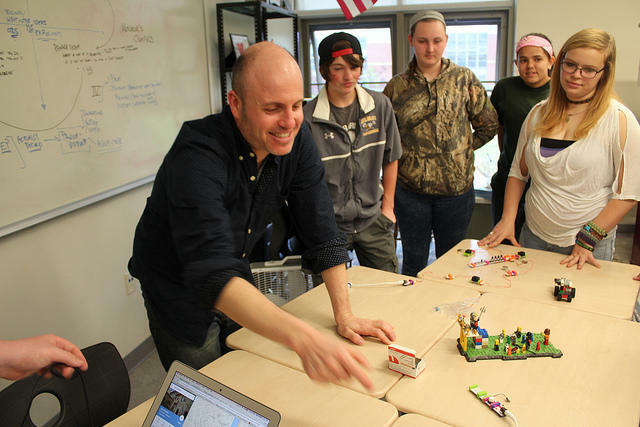 In Maine, the private Gould Academy in Bethel has started adopting design thinking into its own curriculum through a new facility called the IDEAS Center. And other schools in Dover-Foxcroft and Dexter have recently started implementing it among administrators, to brainstorm new ideas and approaches. But in terms of learning, design thinking in Maine is still mostly limited to Ryder’s classroom, so far. Sara Shifrin, the director of Gould’s IDEAS center, says the challenge comes down to properly training teachers and not shoving the new approach down their throats. “You know, how do we integrate design thinking in a way that’s not so disruptive that they’re not gonna want to use it?” Shifrin says. Dan Ryder says he still struggles with this disruption, too. He worries by focusing so much on these prototypes, he may not be doing enough to help his students with traditional English skills such as writing. But in the rapidly changing world of academics, Ryder is confident that new and traditional methods can work together.